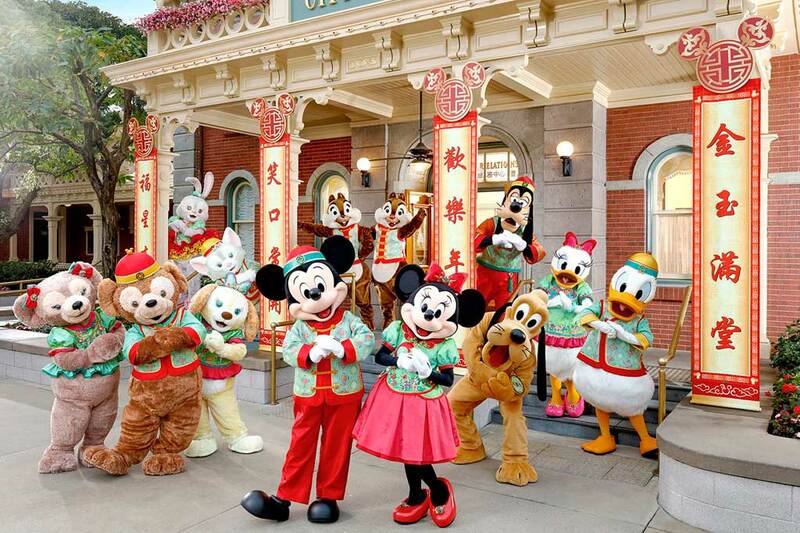 To wish you an auspicious New Year filled with good fortune and happiness, Mickey Mouse, Minnie Mouse, Donald, Daisy, Goofy, Chip ’n’ Dale, Duffy, ShellieMay, StellaLou and Gelatoni are waiting to meet you at Main Street, U.S.A. in their brand new Chinese New Year outfits. (Hong Kong, January 17, 2019) Hong Kong Disneyland Resort (HKDL) will be celebrating the Year of the Pig from today to February 24, 2019. Step into the park filled with Chinese New Year decorations along Main Street, U.S.A. and enjoy a truly impressive array of new seasonal meals and gifts to shop from. 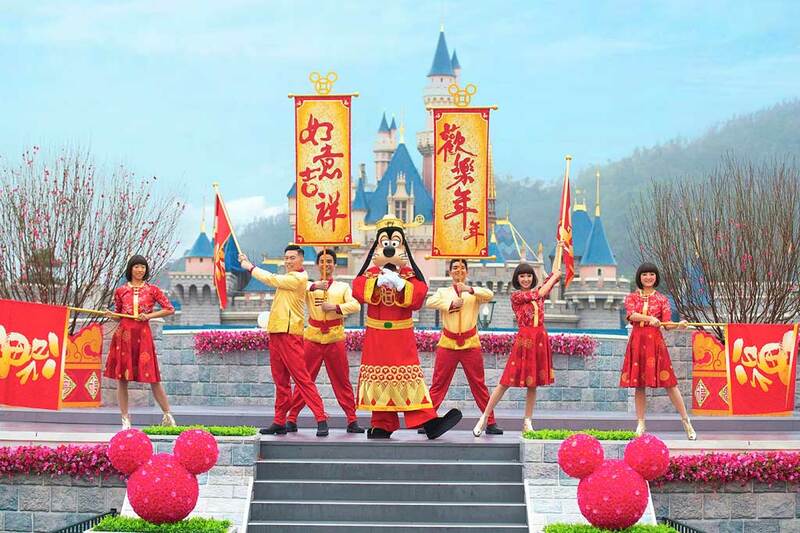 To ring in the Year of the Pig, the Three Little Pigs, together with Mickey Mouse and Friends in their brand new Chinese New Year outfits, will appear around the park to spread warm new year wishes to guests. Do not forget to participate in the “God of Fortune Goofy Celebration Moment” to receive some extra good luck. Also, guests visiting from February 5 to 9 will enjoy extra blessings upon entering the theme park when they are presented with a newly designed Lai See packet. It would not be a perfect Year of the Pig without an appearance from Disney’s cute pig characters, the Three Little Pigs. Everyone loves the classic story of the pigs who built houses out of straw, sticks and bricks to keep the Big Bad Wolf away. 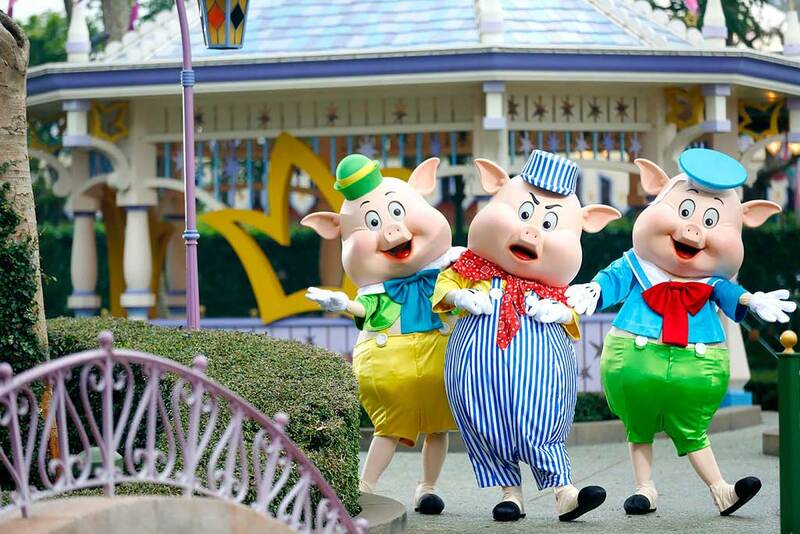 To celebrate the Year of the Pig, the Three Little Pigs will be meeting guests at Fantasy Gardens in Fantasyland. Be sure to snap photos with them to capture these special memories with your loved ones and don’t miss the Three Little Pigs-themed decoration in Town Square. For a fulfilling start of Chinese New Year, gather your fortune at the entrance of HKDL with a newly designed Lai See. These special red packets will be distributed to guests during the first five days of Chinese New Year, from February 5 to 9, while stock lasts. 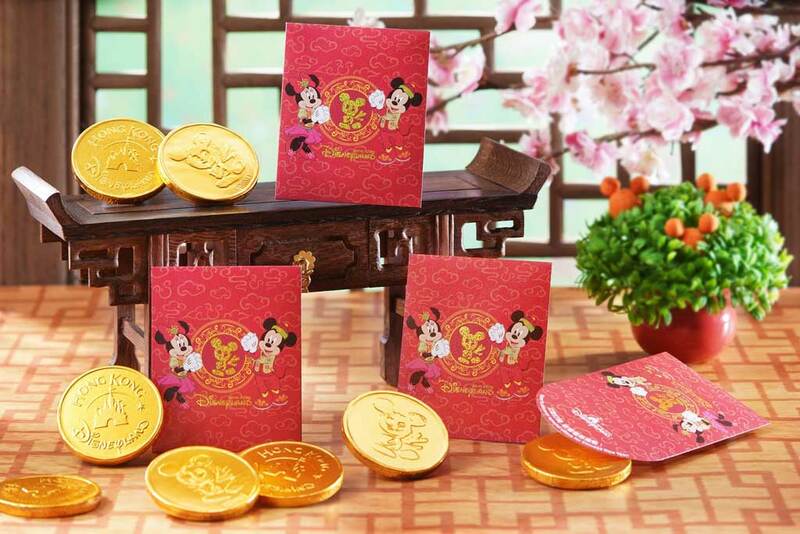 Each red packet includes a delicious chocolate gold coin as well as a merchandise, food and beverage coupon, and guests can share the good fortune with holiday gifts. Immerse yourself in the spirit of Chinese New Year as seasonal décor touches of gorgeous flowers and shimmering lanterns around the park bring prosperity and good fortune for the year ahead. During the upcoming holiday season, guests are invited to join the brand-new “God of Fortune Goofy Celebration Moment” at the Castle Hub Stage. This upbeat dance moment occurs twice a day with a series of traditional Chinese New Year songs. 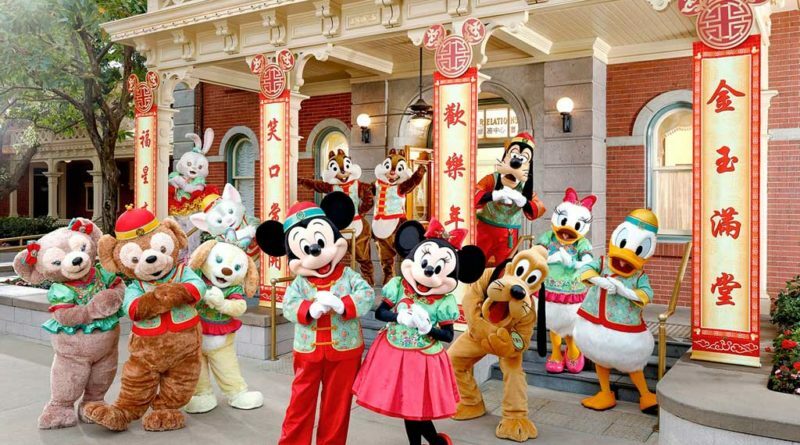 To wish you an auspicious New Year filled with good fortune and happiness, Mickey Mouse, Minnie Mouse, Donald, Daisy, Goofy, Chip ’n’ Dale, Duffy, ShellieMay, StellaLou and Gelatoni are waiting to meet you at Main Street, U.S.A. in their brand new Chinese New Year outfits. Their newest friend Cookie is also joining for the first time, wearing her glimmering Chinese New Year attire. And that is not all — performers dressed in traditional Chinese outfits will appear around the park, bringing surprises and delivering happy New Year wishes to all! The fun of the Year of the Pig continues with festive Chinese New Year food in the park and resort hotels. HKDL is proud to present a total of 60 Chinese New Year-themed food and beverage delights for the season, from full-blown set menus to delicious snacks. Grab good fortune at the Main Street Bakery with sweet and savory nibbles such as the “Gold Ingot,” “Ingot Pudding,” “Wishing Fish” and “Lucky Mousse Cup,” or head to Main Street Corner Cafe hosted by Coca-Cola® to feast on a “Chinese New Year Set” in Chinese, Japanese or Thai style. HKDL offers delicious dining choices for family gatherings. At Studio Lounge, guests can try out an assortment of delicacies in the “Chinese New Year Platter” or its special “Lo Hei”, which stands for good luck and prosperity. Hollywood & Dine is also offering the new “Mini Treasure Pot” for you to be blessed during the year. 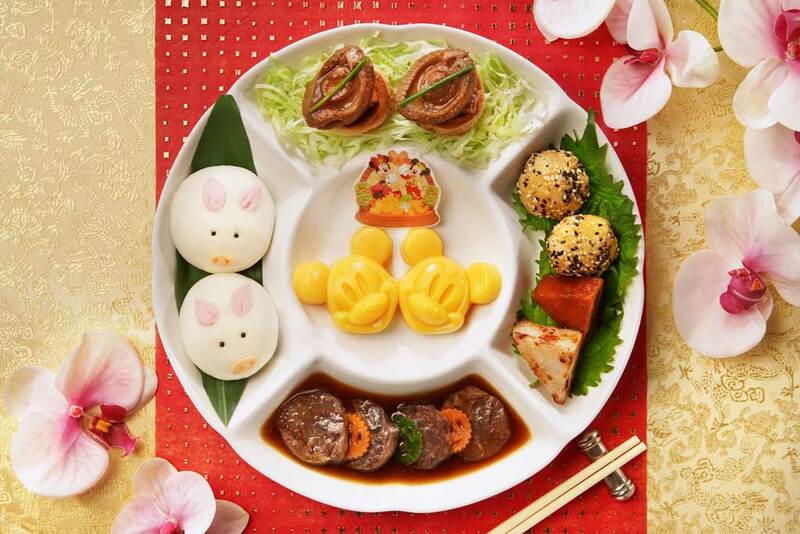 In Crystal Lotus, indulge in the “Everything Goes Well Dinner Set” which comes in nine dishes for some long-lasting good fortune or gather some good luck for you and your family with the “Golden House” set menu at World of Color Restaurant. HKDL is offering more than 50 new and exclusive merchandise items this year, including plush toys, accessories, apparel, stationery, pins, home decor and much more. The new items feature Duffy and Friends, Mickey and Minnie, Disney●Pixar, the Disney Princesses and the Three Little Pigs. 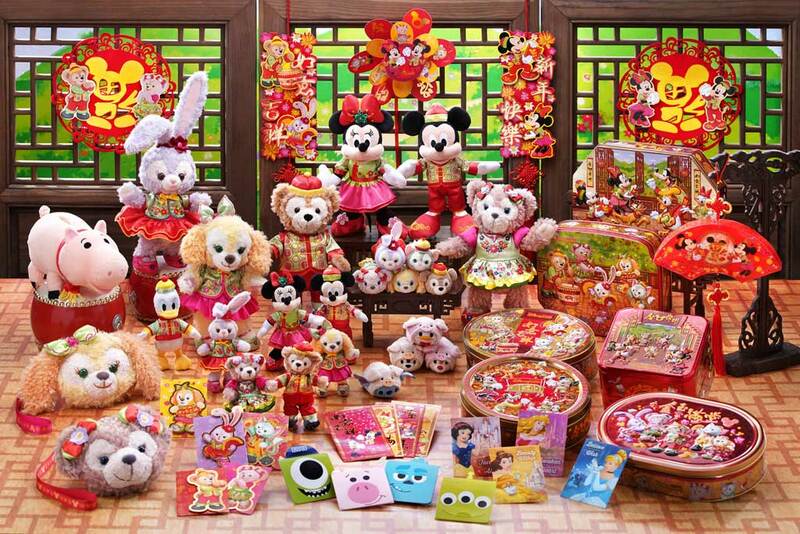 Shop for all-new Duffy and Friends plush toys, key chains, bags and Tsum Tsum in traditional Chinese outfits featuring silky red and green with colourful floral patterns that symbolize the festive spirit! You can also find Cookie-themed merchandise items in traditional Chinese outfits for the first time ever. Among all the Disney style Chinese New Year gifts, guests especially love the new windmill, candy and cookie box, lai see packet or a “fai chun” banner with a lucky message. As a special offer for the Year of the Pig, guests can take home an exclusive Hamm plush toy in Chinese New Year-theme — based on the beloved film “Toy Story” — for only HK$68 when spending at least HK$200 at HKDL’s merchandise stores. Guests are invited to extend the magic of Chinese New Year with a stay at one of the themed resort hotels. Enjoy a complimentary in-room festive overlay in all three hotels and take part in inspirational Chinese traditions through family-friendly hotel activities, including the Feb 5 only Disney Lion Dance tour and Chinese New Year Choir across the three hotels during the first three days of the lunar new year, as well as the Disney Traditional New Year Market which will be organized throughout the holiday season. Little guests can also join the festive themed arts and crafts sessions across three hotels. This year, guests will also have a chance to make their holiday wishes through hanging their written Wishing Card on our Chinese New Year Wishing Wall at the Hong Kong Disneyland Hotel and Disney Explorers Lodge. 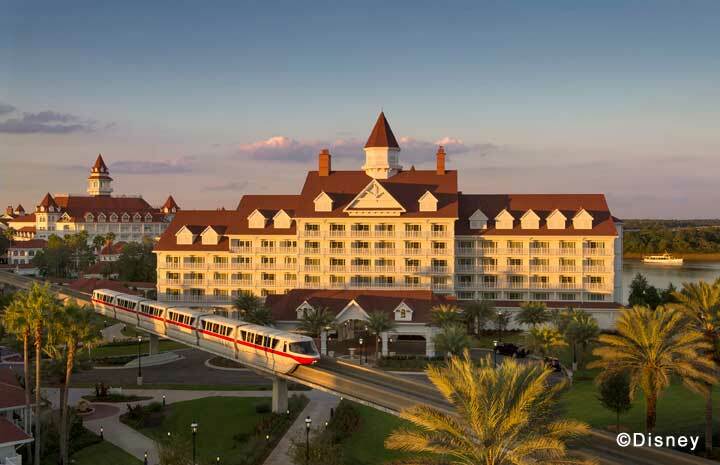 A stay at a resort hotel is the best way to create magical family memories! The festive magic extends to Valentine’s Day. Couples can visit the park during the CNY event period to also experience a romantic holiday together. 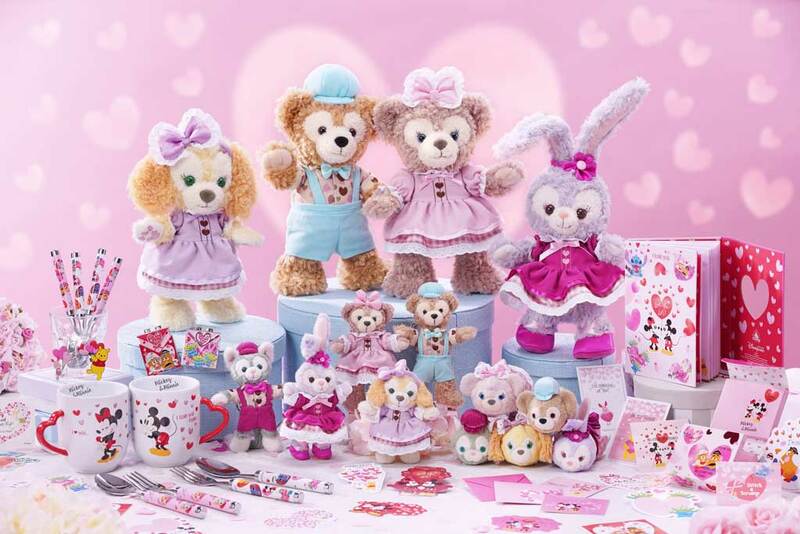 The resort is offering close to 40 Valentine’s Day-themed merchandise items including Mickey and Minnie, Winnie the Pooh and Piglet, as well as Duffy and friends series. After enjoying their time in the park, lovebirds can pamper their significant other with a romantic Valentine’s Day dinner at Studio Lounge, Walt’s Cafe or World of Color Restaurant. It’s the perfect way to celebrate a romantic Valentine’s Day together at HKDL! Birthday celebrations are meant to be so much more than simply blowing out candles and eating a slice of cake. Extra birthday magic await guests that stay at any of the three hotels at Hong Kong Disneyland from today onwards. Hong Kong residents who purchase a “Room and Hotel Breakfast Package” and check-in/ check-out on their birthday* will enjoy free entry to the park^^! Meanwhile, their family and friends are invited to celebrate the birthday happiness together, as they can also enjoy 15% off ticket purchases (up to three tickets)#. For guests that desire an extra special catch-up with their favorite Disney characters during this special time, their birthday wishes are set to come true! By simply booking a hotel room via the “7 days Advance Purchase” offer and checking in during their birthday month^, they can enjoy a free Hotel Character Breakfast Buffet†. For details, please refer to https://www.hkdl.hk/tc-birthday. *Valid check-in dates are Jan 1 – Dec 31, 2019. Actual offer price depends on the check-in and check-out date, the room category selected, the group mix and the Hotel’s Best Available Rate, which is determined at the time of booking (subject to availability and any Benefits Limits, defined in the Hotel General Terms and Conditions). ^Booking must be made during Jan 1, 2019 – Dec 20, 2019, at least 7 days prior to check-in, and valid check in dates are Jan 8 – Dec 27, 2019. ^^Complimentary ticket cannot be upgraded to Magic Access Membership or other ticket types. #Discount is only applicable to purchase of up to 3 one-day standard or child Park tickets in a single transaction. Offer tickets are valid on the date of purchase or the day after only. Offer tickets not used on the purchase date or the day after will be void without refund or compensation. Eligible Guests are required to enter the Park together with his/her Guests using the offer tickets. Guests cannot use the offer tickets without the presence of the Eligible Guest who purchased the offer tickets. The offer is not available to senior admission tickets. At least 3 guests per table (including the birthday guest) to enjoy this offer. Offers are only available to Hong Kong residents with valid Hong Kong Identity Card, and are subject to block-out dates and terms and conditions. For details, please refer to Hong Kong Disneyland website www.hongkongdisneyland.com. 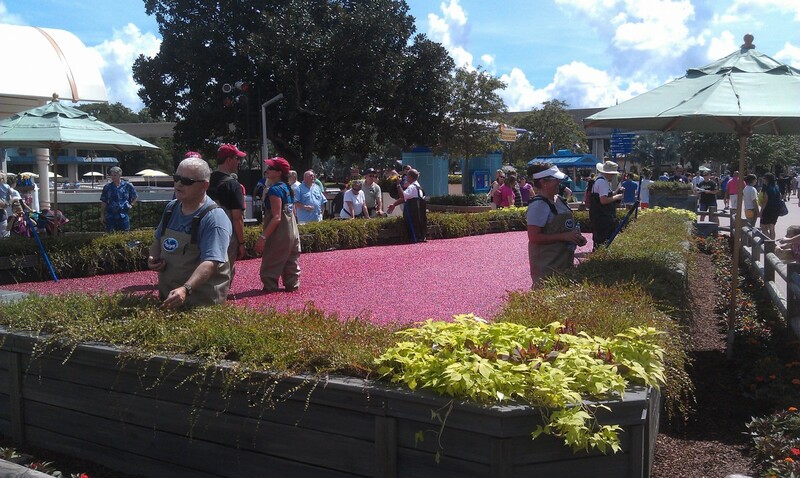 A cranberry bog set up for the festival.